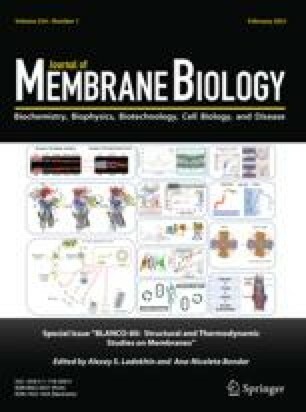 The membrane of mechanically prepared vesicles ofChara corallina has been investigated by patch-clamp techniques. This membrane consists of tonoplast as demonstrated by the measurement of ATP-driven currents directed into the vesicles as well as by the ATP-dependent accumulation of neutral red. Addition of 1mm ATP to the bath medium induced a membrane current of about 3.2 mA·m−2 creating a voltage across the tonoplast of about −7 mV (cytoplasmic side negative). On excised tonoplast patches, currents through single K+-selective channels have been investigated under various ionic conditions. The open-channel currents saturate at large voltage displacements from the equilibrium voltage for K+ with limiting currents of about +15 and −30 pA, respectively, as measured in symmetric 250mm KCl solutions. The channel is virtually impermeable to Na+ and Cl−. However, addition of Na+ decreases the K+ currents. TheI–V relationships of the open channel as measured at various K+ concentrations with or without Na+ added are described by a 6-state model, the 12 parameters of which are determined to fit the experimental data.